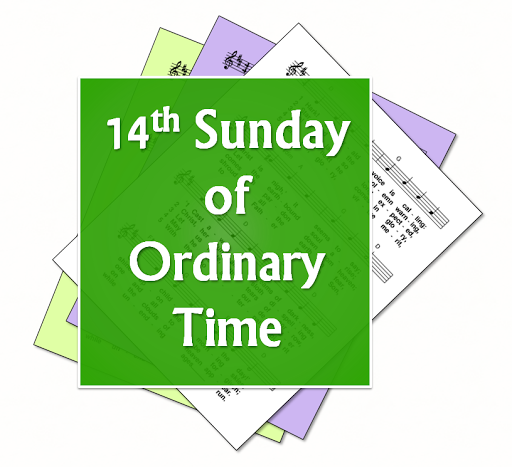 Hymn and song suggestions, based on themes from the Roman Catholic lectionary for the fourteenth Sunday of Ordinary Time, Year A. Most are free-to-use (ie public domain or copyright-free, meaning )the words can be copied and sung to at least one tune with no concerns about copyright or performance licensing - sometimes in a limited setting. Many of these hymns are old / traditional - but where possible a variety of styles and genres are included. First: Zechariah 9:9-10 - Rejoice [Israel] .. your king comes to you .. he will proclaim peace for the nations. Psalm 144 - I will bless your name forever, O God my King / I will give you glory / The Lord is kind and full of compassion / All your creatures shall thank you O Lord / The Lord is faithful in all his words. Gospel: Matthew 11:25-30 - Jesus blesses the father for hiding things from the learned and revealing them to children .. no one knows the Son except the Father .. come to me all who labour, and I will give you rest .. yes my yoke is easy and my burden is light.